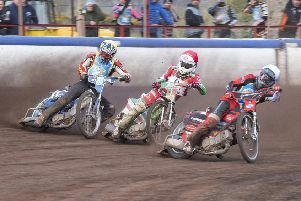 Edinburgh Monarchs are aiming to reclaim the Premier League speedway Pairs Championship at Somerset’s Oaktree Arena tonight following a nightmare defence of their title last season. After skipper Sam Masters and Max Fricke swept to glory two years ago, Masters and new partner Kevin Wolbert were hot favourites to repeat that success in 2015. But when two of Wolbert’s engines went missing prior to the event their chances hit the skids. Wolbert was forced to ride Masters’ second bike but did not pick up a point until his last ride which proved too little too late. Fisher is certainly motoring at the moment after finding double-figure returns hard to come by of late. He was back to his top scoring best in the SkySports televised derby clash against Glasgow Tigers at Ashfield last week. Fisher who was pumped up for the clash which Monarchs lost 51-39, stormed to a brilliant 14 points and was beaten just once by Tigers Argentinian reserve Fernando Garcia. And two days later at Armadale Fisher was on the money once more with 11 points against Berwick Bandits. Fisher revealed: “I haven’t been that happy lately with how my engines have been doing and it’s been costing me points which hasn’t been great for myself or the team. Monarchs team manager Alex Harkess said: “Kevin will be fine for next week his withdrawal is only a precaution. He was having to come back to the UK just for the Pairs and whilst he was happy to do that, he’s not that unhappy now that he’s not! Masters signed for Swedish top-tier (Elitserien) team Lejonen Lions on Tuesday. Group A: Glasgow, Workington, Somerset, Newcastle, Peterborough. Group B: Sheffield, Ipswich (holders), Edinburgh, Rye House, Plymouth.